Here are two tags taken from a toy car. There is another doll which sing when sit on the car. Suspected to be a lf tag but cannot be recognized by pm3 (lf search/lf search u/hf search/hf search u), tried iceman's fork and official version. Any help are welcome. timeout while waiting for reply. Signal looks just like noise. Looking for Hitag signal now. ...so the toy car is the reader and the doll is the tag? did you try reading the doll? otherwise try sniffing the communications between car and doll? doll is the reader since it requires batteries, car has two tags attached in two different positions. See "Sing & Talk しまじろうをBeepy the car"
Well, short distance between doll and toy, could indicate LF/HF and not UHF. You can measure the antenna voltage drop with HW TUNE, to verify its LF or HF. never think about using the hw tune to check the tag. |            |     | 7e  7e  7e  7e  7e  7e  7e  7e  7e  7e  7e  7e  7e  7e  7e  7e  | !crc| ? |            |     | 7e  7e  7e  7e  7e  7e  7e  7e  7e  7e  7e  7e  7e  7e  7e  7d  | !crc| ? |            |     | 85  7b  79  7b  7d  7e  7e  7f  86  84  7a  79  7b  7d  7d  7e  | !crc| ? |            |     | 7d  7d  7d  7d  7d  7d  7d  7d  7d  7d  7d  7d  7d  7d  7d  7d  | !crc| ? the other commands is not implemented yet. Seems not FeliCa too since no output for hf felica litedump. That's probably a Winbond(Nuvoton) 13.56MHz MFID chip, either W55MID15 or W55MID35 and these can be read by a reader based on the W55MID50 chip. Basically the chip does not have any internal memory, it has pins that be connected to either gnd, vdd or floating and they define a 10-bit ID that is transmitted when it's read. I have no idea if it could be read with pm3. It's a very basic RFID system that's designed for use in toys. Sounds like some simpler ASk wave but at 13.56mHz, hf snoop should have picked up a nice trace between reader&tag. decoding of NRZ or Manchester. 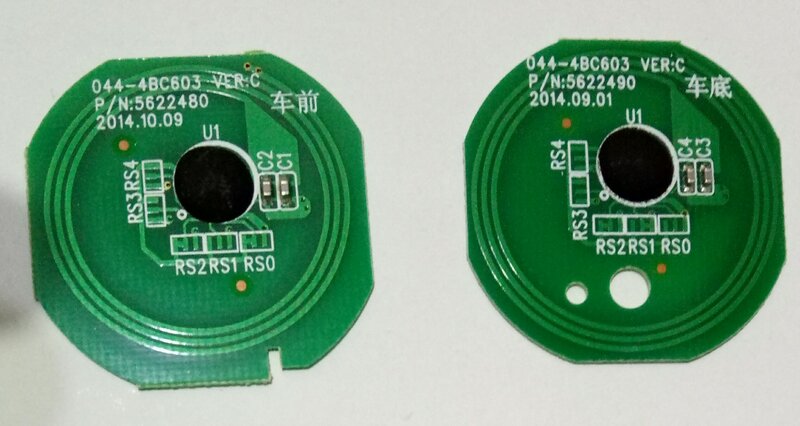 On the W55MID15/35 datasheets, the pins that defines the code are labeled RS0 to RS5, like on the PCB, so there are chances that they use a tag from Nuvoton. However there isn't much info on how the signals are encoded. In the datasheet they state that they use Manchester coding and and they don't mention any subcarrier but this doesn't necessarily means there isn't one. The tag may also need a wake up command to send its ID, even if there is no anticollision.